Why not try our famous dough balls? 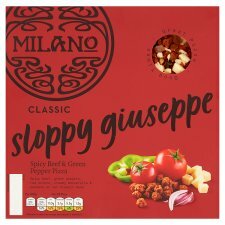 They are great with pizza and salad to create a perfect Milano night in. If your feedback is about a particular product, please let us know the Use By date and code from the front of the pack and where you bought it. Keep refrigerated. If, freezing, freeze on day of purchase and consume within 1 month. Once thawed do not re-freeze. For best results cook from chilled. Ensure pizza is piping hot before serving and serve immediately. These are guidelines only as all cooking appliances vary in performance. P.S. If there's any leftover, please don't reheat it, it's nicer cold. 1. The first step to pizza heaven is a piping hot oven. 2. Get rid of all the packaging and even out the toppings. If you're feeling creative, add some of your own. 3. Drizzle a little olive oil over your pizza to give it a crispier finish. 4. Place your pizza directly onto the top shelf of your pre-heated oven. 5. Cook in line with the timings below. You'll know it's done when the cheese is golden brown and the base is crispy. 6. Remove carefully and serve it fresh out the oven (just like we do). Enjoy!